It's moldable, bendable, reusable … and stickable! Wax Works sticks to itself or paper, but it won't stick to hands or make a mess. Make 3-D animals, people, flowers — anything you can imagine! You can also wrap Wax Works sticks around a candle to create colorful drippings, or around styrofoam balls to create beautiful 3-D shapes. Wax Works sticks are fun and easy to use! Bright Hues, Set of 48 — These thin wax strips measure 8" long × 2 mm diameter, with a fiber strand running through the middle. The set includes eight assorted colors. 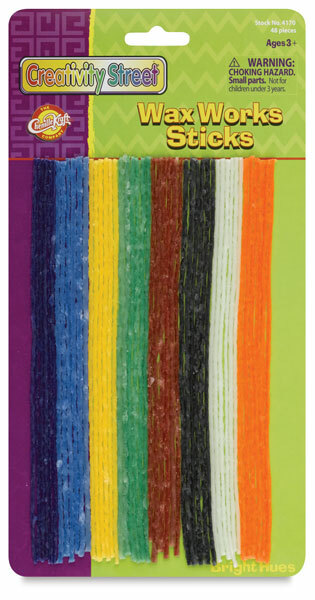 Hot Colors, Set of 50 — These wax strips measure 8" long × 4 mm diameter, with a fiber strand running through the middle. The set contains 50 sticks, 10 each of five hot colors. 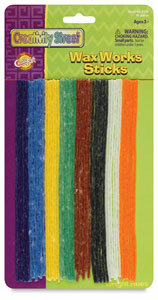 Bright Hues, Set of 50 — These wax strips measure 8" long × 4 mm diameter, with a fiber strand running through the middle. The set contains 50 sticks, 10 each of Red, Orange, Blue, Yellow, and Green.